It’s Thursday, it’s nine o’clock and I’d like to welcome Matthew Hirtes author of Going Local in Gran Canaria into the studio today as my guest on the Thursday Throng author interview slot. The full title of the book is Going Local in Gran Canaria: how to turn a holiday destination into a home and that will give you a great idea of where the book is going to take you; although you shouldn’t be misled, it is full of exceptional information for the traveller and the home-owner alike. As well as doing this interview, Matthew is also giving one lucky commenter a signed, paperback copy of Going Local In Gran Canaria, and whoever get’s it is going to want to go as much as I did when I was reading it. As you may remember from a post I wrote some ago called – how to write a travel guide – I love to read the tales of travellers, whether they live in the country or are just passing through, but with one caveat, I like my travel guide to be inspirational and to inspire me to want to try it for myself and this certainly does just that. Matthew breaks down the Island perfectly, and looks at what you can do as a short break tourist or someone who is planning to spend the rest of their life there. What he demonstrates is that there is literally ‘something for everyone’ on Gran Canaria. I love to find out about the places the locals go to, you know the ones the tourists don’t get told about; it makes me feel rather special as I sit and drink whatever local hooch happens to be thinking to myself ‘they must all think I live here too‘. It makes me feel I have gained brownie points because I made the effort. In my humble opinion, travel guides should always strive to do this because let’s face it, every website will tell you what tourist traps you should be visiting; but it takes someone dedicated and passionate about a place to show the side that they fell in love with. As well as this priceless information, you get the bonus of a whole raft of things you might want if you are thinking about living there and the practicalities of being in a foreign country. Just because you’ve been to the canaries before, don’t assume you already ‘know it all’, I’ll guarantee that after reading this book, you’ll realise you didn’t know Gran Canaria half as well as you thought! I played goalkeeper for Nottingham Forest Boys. However, I was advised to hang up my gloves at 16 – when I was still only 5 foot 2. I’ve since grown but I’ve wondered, every now and again, if I would have made it as a professional. My bank manager would certainly have been happier if I’d had. I’d love to be bilingual, like my boys. I envy their ability to switch between languages as if they’re casually flipping between channels on a hotel television. Yes. With the year we’ve had on the heat front, believe me the fewer clothes you have on; the more comfortable you are. I have to remember to put something on if anybody calls me on Skype, however. Else, the person trying to contact me might get confused and think I’m in the middle of a ChatRoulette session. Charles Bukowski’s Factotum. Although I would have to have undergone countless liver transplants in the process. For the purposes of research, you understand. Are you planning a trip to Gran Canaria or even hoping to move there to live? If so, then you might want to leave a comment below and be in with a chance of winning the Signed Copy that Matthew is giving away to one lucky recipient. 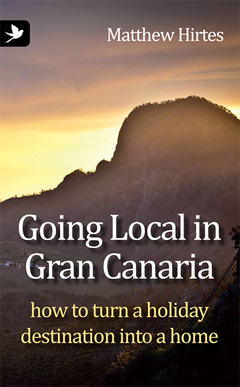 If you would like to get a copy of Going Local in Gran Canaria then you can it on Amazon in the UK and on Amazon in the US too; you’ll also find my reviews of Matthew’s Book on Amazon in the US, the UK and on Goodreads too. I am interested in what a chat roulette session is. I thought I knew him well ,,,,, and know his darkest secret but chat roulette?!?!??!?!?! Having visited Gran Canaria on numerous occasions in the past it would be interesting to know it from the perspective of someone who actually lives there and has taken the time and effort to research the island to enables others to get the best out their visit. But I would advise you to return to the relevant section in which I mention CR. I’m talking about people assuming I’m on it rather than actually using it. There is a subtle difference. Syntax is my Weekly Word: Can you guess my alternative meaning?